This document will introduce and explain the interface aspect of the Crossfire GTK Client and for Crossfire v1.5 and earlier. 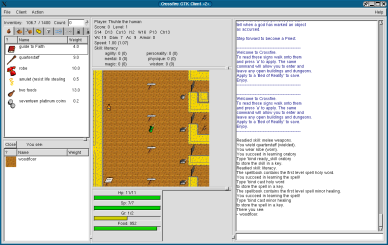 The GTK Client provides the player with an interface which allows them to interact within the Crossfire world. The GTK Client is divided into six sections. Keep in mind by adding the -split option when launching the client will result in all 6 sections floating independently of each other vs compacted into a single display window. The Stats Area contains all the vital statistics as it relates to your character. First field displays your character's name. In this example, we are using "Thuhle." Up next is the player or character's Title. In this example, the title is the default for a new player - their race - which is human. All characters (except fire hatchlings) have the ability to change their title, by using the title command. More on this later. On the second line is the character's Score. This is a value that ranges between 0 (level 1) and 67,200,000,000 (level 115). You gain experience (and Level - covered in next section) by successfully using Skills and by slaying monsters by various means (spells, weapons or physical attacks). Right now Thuhle has zero experience. After Score, comes Level. Your character level depends on the amount of experience your character has gained or acquired (tracked in the Score: field). The progression of Level can vary depending on the Experience system the server is using. As you can see, Thuhle is level 1. The third line shows all the player stats or attributes. These are referred to as the seven primary attributes and include Strength (S), Dexterity (D), Constitution (Co), Intelligence (I), Wisdom (W), Power (P) and Charisma (Ch). The primary attributes affect all actions your character performs. Strength is a measure of the physical power. Can affect damage and how much can be carried without losing speed. Also affects how often the character can attack. Thuhle's current Strength score is 14. Dexterity is a measure of physical agility. This helps the character avoid being hit by monster (or player) attacks. Also affects the Armour Class and the Speed score. Thuhle has a Dexterity score of 13. Constitution is a measure of physical health and toughness. Also affects the maximum Hit Points. Thuhle's current Constitution score is 13. Intelligence measures the ability to learn Skills and incantations (both prayers and magic.) Thuhle has an Intelligence score of 12. Wisdom measures the ability to learn/use divine magic (prayers). Also affects Maximum Grace. Thuhle's current Wisdom score is 16. Power measures magical potential. Also affects the maximum Spell Points (Sp) and Grace (Gr) gained per Level. Thuhle has a Power score of 13. Charisma measures social and leadership abilities. Also affects the prices when buying and selling items. Thuhle's current Charisma score is 13. How skilled the characters melee/missile attack is. Lower values indicate a more potent, skilled attack. Current weapon, user Level and STR are some things which effect the value of Wc. The value of Wc may range between 25 and -72. Thuhle current has a Wc (Weapon class) score of 19. How much damage a melee/missile attack by the character will inflict (or subtract from the target opponent's Hit point value; zero meaning death). Higher values indicate a greater amount of damage will be inflicted with each attack. Thuhle can inflict 7 points of damage with each successful melee strike. Ac (Armour class) shows how protected the character is from being hit by any attack. Lower values (negative) are better. Ac is based on the character race and is modified by the DEX and current armour worn. For characters that cannot wear armour, Ac improves as their level increases. The value of Ac may range from 10 to -40 (or more). Thuhle's current Ac is 9. Armor indicates how much damage (from attacktype: physical) that will be subtracted from successful hits made upon the character. This value ranges between 0(%) to 99(%). Current armour worn primarily determines Arm value. Thuhle is not very well protected with an Armor score of zero. Speed covers two categories: Movement speed and weapon speed. Movement speed is displayed first, followed the by attack speed which is included in parenthesis "(" and ")". Instead of gaining experience for basically just killing monsters (and disarming traps) players have the opportunity to gain a variety of experience through the use of skills. This area of the client displays the current, active, readied or last used skill. In this case, Thuhle just used the literacy skill. A note on Skills: certain skills are automatically available to certain character races (ex: smithery for dwarves). Other skills are automatically available to certain classes or professions (ex: woodsman for barbarians). In this example, a dwarven barbarian would start with both the smithery and woodsman skills. Many other skills can be learned by your character by successfully reading (learning) skills from scrolls. That's not the end of it, certain items allow a character to use a skill when the item is equipped. For instance, an applied holy symbol will allow a character to learn and cast prayers - but only when the holy symbol is in use or within the character's inventory! The six individual experience categories summarize the experience and level(s) obtained via the skill subset. Here is how it works; each experience category is made up of a subset of skills. Successfully using any of those skills will accumulate experience in the parent category (agility, mental, magic, personality, physique and wisdom). That experience is tallied and used to determine your level in that skill and also adds to your total or overall character Level mentioned earlier. Numbers inside of the parenthesis is your level in that category. Numbers outside the parenthesis is your experience in that category. Includes skills that have to do with manual dexterity, quickness and coordination. Included skills are disarm traps, hiding, lockpicking, and stealing. All characters start with the disarm traps skill which allows characters the ability to deactivate or defuse various traps on doors, chests, floors, etc. The default key for this skill is "d"
The skill hiding can allows for a limited form of invisibility. If the character attacks or move too much they become visible. The skill can accessed by wearing any of a number of items (magical rings or boots) or learned by a special skill scroll called "concealment". Halfling characters automatically have this skill. The skill lockpicking requires lockpicks to be used or applied and allows the player to open regular doors with a key or bashing them down. The skill can be accessed by nearly all characters races except fireborn, dragons and quetzalcoatl. 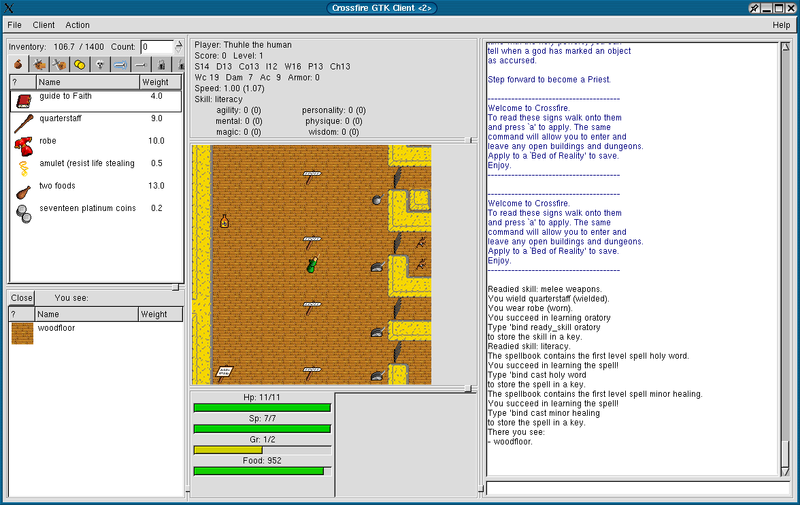 The skill stealing allows the player the ability to pilfer a monster or players inventory. The skill is only available to the thief and swashbuckler character classes, and the Halfling and Half-Orc race, and can be learned by all other characters by a special scroll called "stealing." Includes skills that have to do with intellectual knowledge and rational interpretation and recognition. Included skills are alchemy, bowyer, find traps, jeweler, literacy, smithery, thaumaturgy, and woodsman. The skill alchemy can be used to identify potions, containers, flesh parts, and amulets. With access to a cauldron and the necessary ingredients, a character can also create numerous items for in-game use. The alchemy skill is automatically available to the Alchemist character class, and can be learned by all other characters by a special skill scrolled called "alchemy." The skill bowyer can be used to identify bows & arrows, crossbows & bolts. Elf characters automatically have this skill and can be learned by all other characters by a special skill scrolled called "bowyer." All characters start with the find traps skill. The default key for this skill is "s"
The jeweler skill can be used to identify gems and rings. The jeweler skill is automatically available to the Thief character class, and can be learned by all other characters by a special skill scroll called "jeweler." The literacy skill can be used to identify books and scrolls. It also allows the player to read scrolls, books, grimores and prayerbooks. All characters start with the literacy skill, except for the Barbarian class. The smithery skill can be used to identify weapons and armor. The smithery skill is automatically available to the Dwarf race and the Alchemist class. The skill can be learned by other characters by a special skill scroll called "smithery." The thaumaturgy skill can be used to identify rods, wands and horns. The thaumaturgy skill is automatically available to Alchemist and Sorcerer class. The skill can be learned by other characters by a special skill scroll called "thaumaturgy." The woodsman skill allows the possessor will move faster through "wooded" terrain (forest, grasslands, brush, jungle, etc.). If actively used, this skill will identify foods and flesh parts. The woodsman skill is automatically available to the Elf race and Barbarian class. The skill can be learned by other characters by a special skill scroll called "woodsman." Includes skills that have to do with incantations and mage or wizard spells. Included skills are wizardry and sense magic. The wizardry skill allows the character to cast "wizard" or arcane spells. The wizardry skill is automatically available to the Devotee, Sorcerer and Wizard class; the Alchemist, Evoker, Summoner and Warlock have the ability to use wizardry because they possess a talisman. Note: Any character has the potential to use wizardry once they have and keep a talisman in their possession. The skill can be learned by other characters by a special skill scroll called "spell casting." The sense magic skill allows the character to determine if the items in their inventory or directly on the ground beneath them have magical enchantments. Additional skill or spell use is required to fully identify a magic item. The sense magic skill is automatically available to Monk and Sorcerer class. The skill can be learned by other characters by a special skill scroll called "sense magic." Includes skills that have to do with your in-game persona. Included skills are oratory and singing. The oratory skill allows the the user to "recruit" followers. Recruitees must be of lower level, and un aggressive to start. Use of this skill may anger the audience. Also, "special" monsters are immune to recruitment. Success depends on player's Charisma and level. All characters start with this skill. The singing skill allows the user to pacify hostile monsters. Certain kinds of monsters are immune. Success depends on player´s level and Charisma. The skill can be learned by other characters by a special skill scroll called "singing." Includes skills that have to do combat and ranges from melee to missile attacks and hand-to-hand fighting. Included skills are clawing, flametouch, karate, melee weapons, missile weapons, punching and throwing. The clawing skill allows the user to make a bare-handed attack. Damage is based on the user's Strength and level. This is the default "hand-to-hand" fighting skill for the Quetzecoatl and Dragon character race. The flametouch skill allows the user to make a bare-handed attack. Damage is based on the user's Strength and level. This is the default hand-to-hand fighting skill for the Fireborn character race. The karate skill allows the user to make a bare-handed attack. Damage is based on the user's Strength and level. This attack is the fastest and (at higher levels) most deadly of the hand-to-hand attacks available. The karate skill is automatically available to the Monk and Ninja class. The skill can be learned by other characters by a special skill scroll called "karate." The missile weapons skill allows the user to make attacks with ranged weapons (eg bow, crossbow). The missile weapons skill is automatically available to the Elf race and the Barbarian, Ninja, Paladin, Swashbuckler, Thief, Warlock and Warrior character classes. The skill can be learned by other characters by a special skill scroll called "missile weapons." The punching skill allows the user to make a bare-handed attack. Damage is based on the user's Strength and level. This is the most feeble of the hand-to-hand attacks. The skill can be learned by other characters by a special skill scroll called "punching." The throwing skill allows the user to hurl the top most item in their inventory as a missile-like attack. Includes skills that have to do with prayers and invocations. Included skills are praying and sense curse. The praying skill allows the character to cast "priest" or divine spells. The prayer skill is automatically available to Gnome race and the Monk, Priest, Summoner and Wizard character classes; Paladins have the ability to use praying because they possess a holy symbol. Note: Any character has the potential to use praying once they have and keep a holy symbol in their possession. The skill can be learned by other characters by a special skill scroll called "piety." The sense curse skill allows the character to determine if the items in their inventory or directly on the ground beneath them have magical enchantments. Additional skill or spell use is required to fully identify the cursed item. The sense curse skill is automatically available to Monk and Priest class. The skill can be learned by other characters by a special skill scroll called "sense curse." All information text, events and other action is displayed in this window. This can range from player communication (tell, reply, shout, say) to displaying specific command output (such as skills or spell list). Multiple commands can be bound to the same key be separating them with semicolons. will bind those two commands to the S key. Without number it displays current bindings, with # it unbinds it. toggle audible low on food warning. If food < 200, on every 4'th food loss, it beeps. If food==0, then every 4th or 5th time the function is called, it beeps. Get updated list of metaservers and show it. Warning: This may freeze the client until it gets the update. If no options are given, it applies an object you are standing on. -u: Always unapplies the object. These two options disable the toggling feature. Toggles brace status. While braced you will not move. 'help range for more information on range weapons. Readies and applies the skill disarm traps, also executes a single disarming action in 10 directions. Often used with the command search. See also search. Player becomes the dm, if able. name is the name of the item(s) to drop. It may match multiple items. The name is matched against the start of the objects in your inventory. The name matching is case insensitive. all - matches any item. cursed - drops items known to be cursed or damned. number is optional. This acts as the number of the object to drop. The objects number must be at least the number for it to be dropped. For example, if you do 'drop 10 scroll', only groupings of 10 or more scrolls will be dropped. A collection of 5 scrolls will not be dropped. Drops all but locked objects in inventory. Examines object and displays details. defaults to object or floor you are currently standing on. Sends a message only to members of your party. will send the message "I need help" to all party members only. Help on subject, defaults to shows list of available help. Show list of highest player scores. 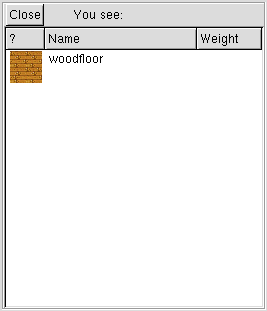 Displays all items (name and weight) you are currently carrying and your total weight. The invoke command is used to cast a spell immediately, or when it is necessary to give a parameter to the spell. Invoke will not set the range weapon. Kills your summoned pet monster(s) immediately, leaving behind any items the pet may have picked up. Changes the level of your hearing. Displays total number of monster kills for a party. Shows which stuff is taking up how much memory. Displays information (directory, creator's name, email address, creation date. If there's been any updates, if so, by who and when) on current map. Show status of all active maps. Shows message of the day again. Executes a single step north. Executes a single step northeast. Executes a single step northwest. As of version 0.91.7, new output handling was added. The behaviour is controlled with the output-sync and output-count commands. Set of commands used with simple party system. Forms a party and puts you as leader, 32 character max. At the moment, being party leader does nothing. May be used in the future. Changes the passwd for the party you are in, 8 character max. Toggles peaceful status (You will attack other players vs.
Changes how you pick up items when you step on them. To pickup an item manually, use the ',' key. Mode 0: Don't pick up items. a value density greater than the pickup mode. Value density is value in gold/weight in kilograms. sold it in the shop. 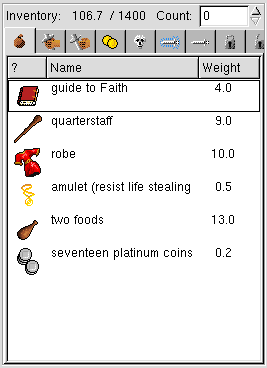 Density 10 will pickup silver, gold, rings, wands, books, and scrolls. Artifacts are also picked up. Lists all player files currently in existance on the server, sorted by creation date. Alias for the cast command. Exit the game and delete your character. to where you entered the game), get on top of it, and Apply it using shift-A (capital A). Prepares a skill for use. Replies to the last person who told you something. Rotate the range slot by 1. Rotate through all known spells alphabetically. backup copies if you fear the server is about to crash. WARNING--if you want to leave the game without destroying your player, you must find a 'Bed to Reality' and hit A on the bed to apply it. Doing 'save and then quitting will still delete your character. Saves your current window layout. Say something to all players on your map. Readies and applies the skill search, also executes a single search action in 10 directions. Often used with the command disarm. See also disarm. Does an automatic search and sort for items of a set. Would automatically pick up all items containing the word 'magic+1'. Sends a message to all players logged in the game, regardless of the map. Show all available skills, experience categories and level. Shows various useful information about your character. None of the information it shows is stuff that is not contained in the documentation. As of now, it shows how much experience you need for your next level. It also shows natural, real, and maximum statistic values. Your natural stat is the stat without any items/spells applied. Maximum is the maximum value for your natural stat. Shows the status of shared string parameters. 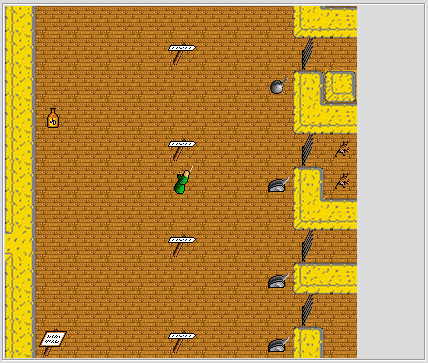 The take commands take object(s) on the space the player is standing on, and inserts them into the players inventory. If no parameter is given, take will get the top object that can be taken and put it in the players inventory. If no object can be taken, that will be stated. A parameter can be given to take. In this case, all object that have names that match the parameter will be picked up. Thus, if there is a 'sword of WOE', and 'sword +1' and a 'sword -3' on the ground, 'take sword' will pick all of them up. By default, take is bound to the comma key, with no parameters. To change this, look at the bind command. Tell character who (only) the msg. Changes your title to string. This is a server setting, and does not work for the dragon race. A set of commands to reverse key bindings. Without -g command uses user's bindind, with -g global binding. The usekeys option determines the behaviour of using keys. keyrings: Only keys in active keyrings are used. containers: Only keys in active containers are used. Note that keyrings are just a specialized container, so the containers will also find keys in keyrings. Only active containers are used - keys will not jump out of closed containers, but hints will be given if you have keys in such containers. Print out of current version and all the contributors (developers and artists) of Crossfire. Executes a single step west. Shows what players are currently logged on, and their in-game location. Automatically run away when hp < wimpy% * Max hp. The Stat Bar Window can be found in the bottom middle of the client interface. This area displays your vital statistics and a colored bar for easy reference. Hp (hit points): Measures of how much damage the player can take before dying. Hit points are determined from the player level and are influenced by the value of the character's Constitution score. Hp value may range between 1 to beyond 500 and higher values indicate a greater ability to withstand punishment and damage. Sp (spell points) - Measures of how much "fuel" the player has for casting incantations. Spell Points are calculated from the character level and the value of the character's Power score. Sp values can range between 1 to beyond 500. Higher values indicate greater ability to cast more spells. Sometimes this is referred to as Mana. Gr (grace) - How favored the character is by the gods. In game terms, how much divine magic a character can cast. Grace is calculated from the character level and the value of the character's Wisdom and Power score. Grace values can range between 1 to beyond 500. During play, grace values may exceed the character maximum; grace can take on large positive (praying on the god's altar) and negative values (casting spells and now praying to replenish grace). Positive values indicate favor by the gods; Negative values means the god may not grant the next spell cast or severely hurt (or kill!) the player with divine retribution. Food - How full the character's stomach is. Ranges between 0 (starving) and 999 (satiated). At a value of 0 the character begins to die (loses 1 Hp per tick). Some magic can speed up or slow down the character digestion. Healing wounds will speed up digestion too. The "Look" window can be found in the lower left corner of the client interface. This area displays any item or items that are on the ground beneath you (plus the floor type - in this case, woodfloor) or the contents of a container such as a bookshelf, bag, treasure chest, etc. Left clicking on the item will examine the object and display various properties such as title, material type, weight, cost, etc. When one applies a container, the contents of the container will also display in this window. The same commands (mentioned above) also apply to items inside the container. Clicking on the Close button (upper left corner of the window) will close the container and allow you to continue on your way. The inventory window display all items and equipment you currently have in your possession. Left clicking on an item will examine the object and display various properties such as title, material type, weight, cost, etc. Note: holding down shift and left clicking on an item will "lock" the item, meaning you will not be able to drop it until you remove the "lock" by shift + left clicking on the item again. Note: holding down the shift key and middle click on an item will "mark" the item, which is used for such things as lighting a torch or lantern, enchanting armour via Enchant Armour scrolls, etc. Encumbrance: displays total weight (kg) of all items carried. The number after the slash ("/") is the maximum weight that your character may carry - the closer you get to that number the slower your movement and attack speed. It is possible to carry so much weight that the client will only process a command every 3 to 5 seconds. Count: Use this window when you want to drop or pickup a specified number of objects. Values can range from 0 - 999999. You can either type in a number or use the up and down arrows to toggle the count by 1. Note: to reset the count back to zero from a very large number, keep hitting the zero key until it's reset. Unlocked Items | open lock: when selected, displays all items that have not been locked. Name column: The name of the item in your inventory. In some cases, magic properties of some items are displayed as well. Weight column: The weight of the specific item in your inventory. applied (worn) - armor, helms, clothing, etc. readied (readied) - wands, rods, etc. The View Window is where all the in game action takes place. Everything from object and player interaction to visual effects. The Client menu bar contains additional configuration options and settings.Click on File, Client or Action for to activate the dropdown menu and view the options. Save Config - saves the client configuration such as display options, stat bar settings, etc. Certain text (shout, tell, etc.) appear as a different color in the "Action Window"
The "Action Window" is split into two panes with different information displayed and tracked in each. Generally communication in one and performed actions and results in the other. All the different "windows" of the client are separated out, floating and independent of each other. Can also be accessed by using the -split option when launching the client from the command line. Map Size: Larger maps lets you see more information, but takes more CPU power and bandwidth. Changing these will not take effect until the next time you connect to a server. Face set to use. Only takes effect for new face information from server. Not supported on all servers.